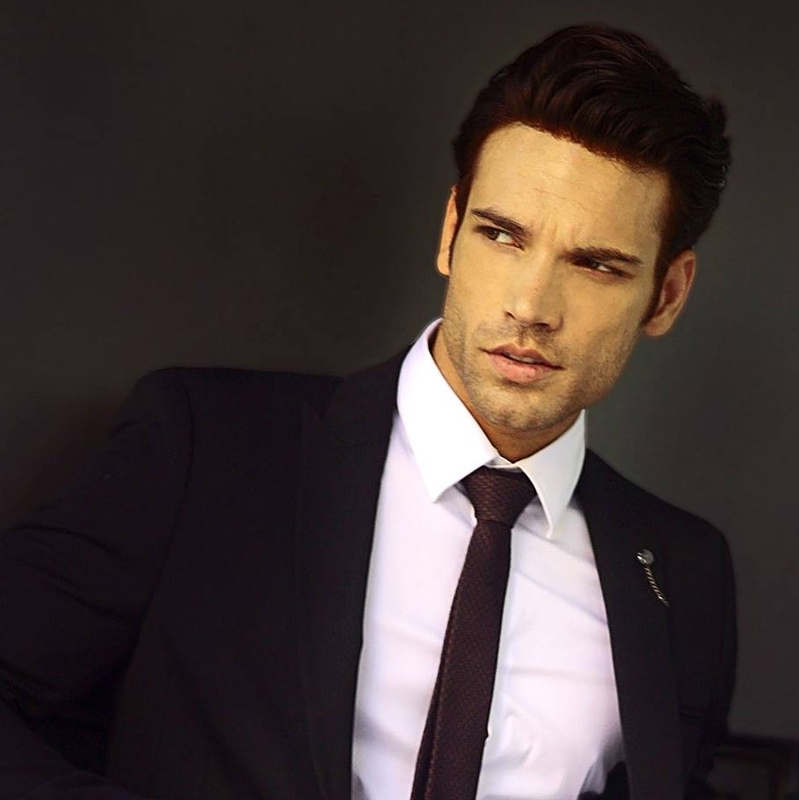 Many have no shame when they ogle at a black suit on a man with the poise to carry it off with a delectable swagger. As prefaced before, there are several ways – precisely six in my mind – to spice up the black suit story. 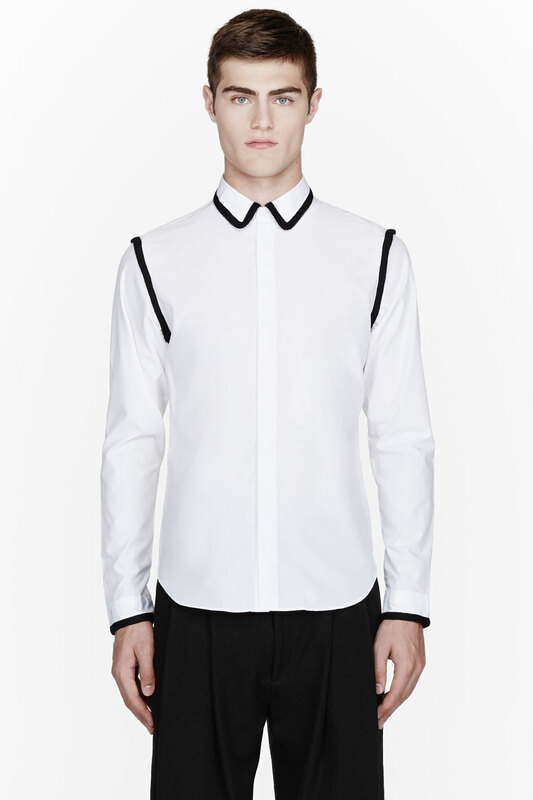 But what about the era of the bleached white shirts, going from tux savvy to simply collarless? 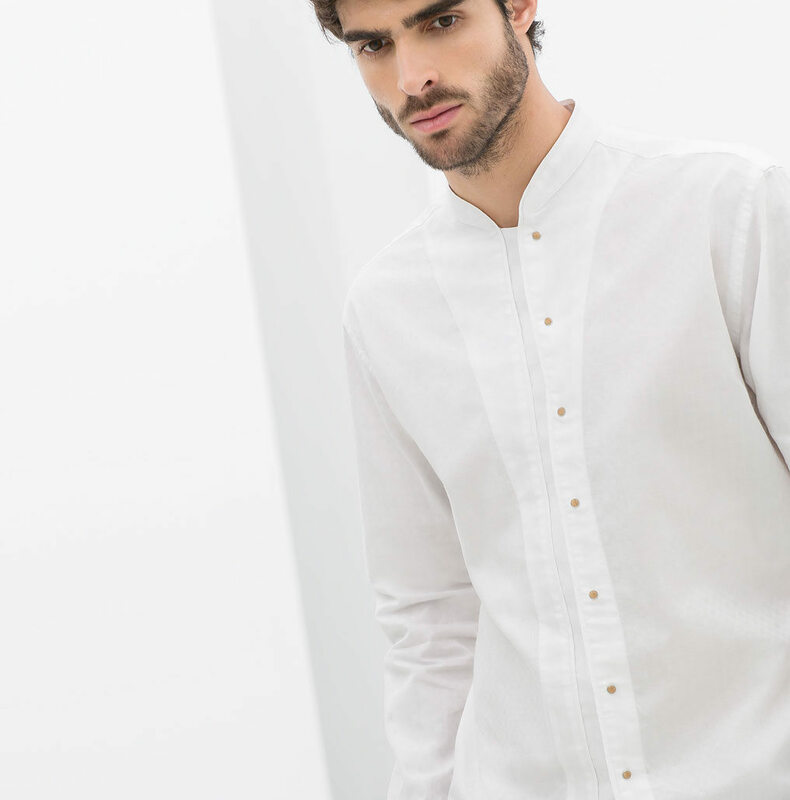 Taking cue from black suits comes the story of the white shirt, and 5 ways to make them more sumptuous, with favorites from fashion collections of SS14. 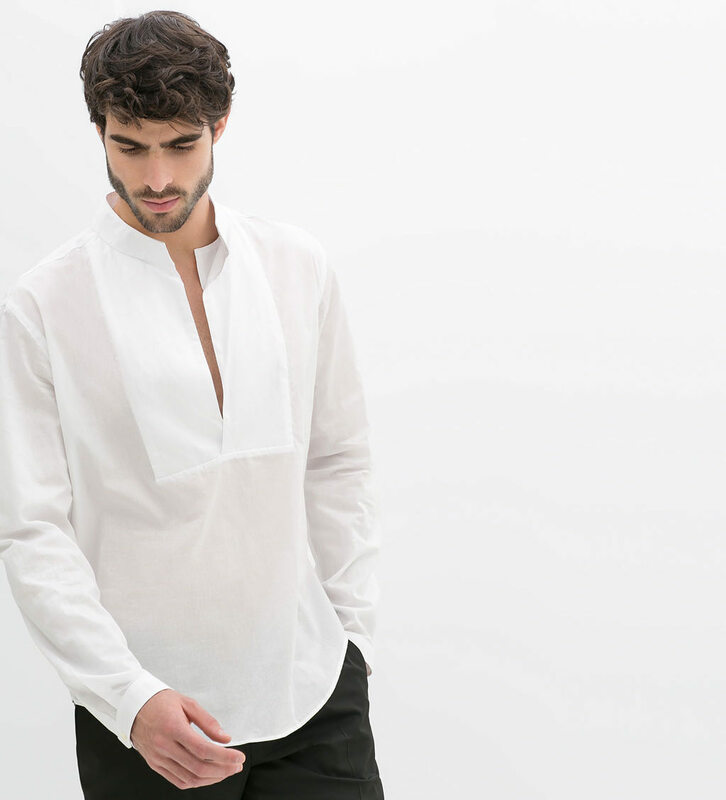 Get ready to refresh, refine, and ultimately, redefine the white shirt that has held a staple spot in our closets since our existence (well, almost). 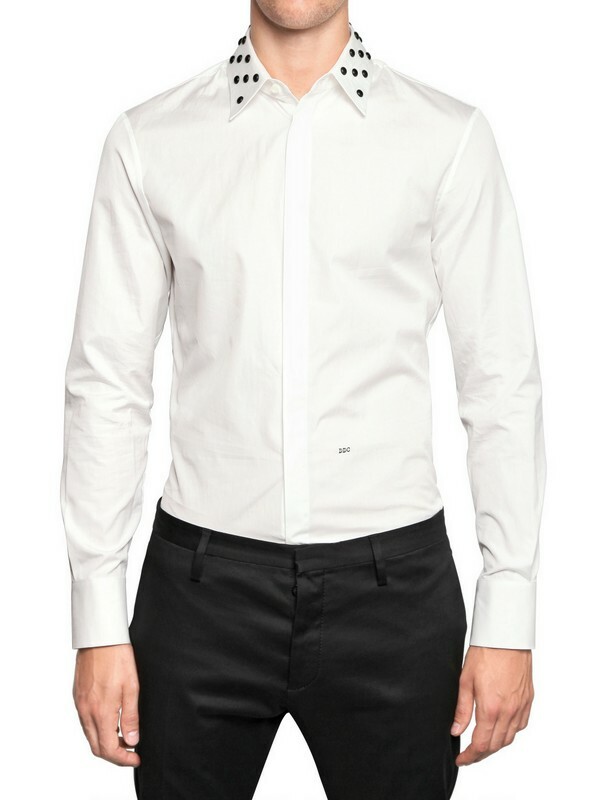 I have seen men yank and squirm at collars closing in around necks that are getting wider courtesy of a hefty diet or a strong shoulder workout. 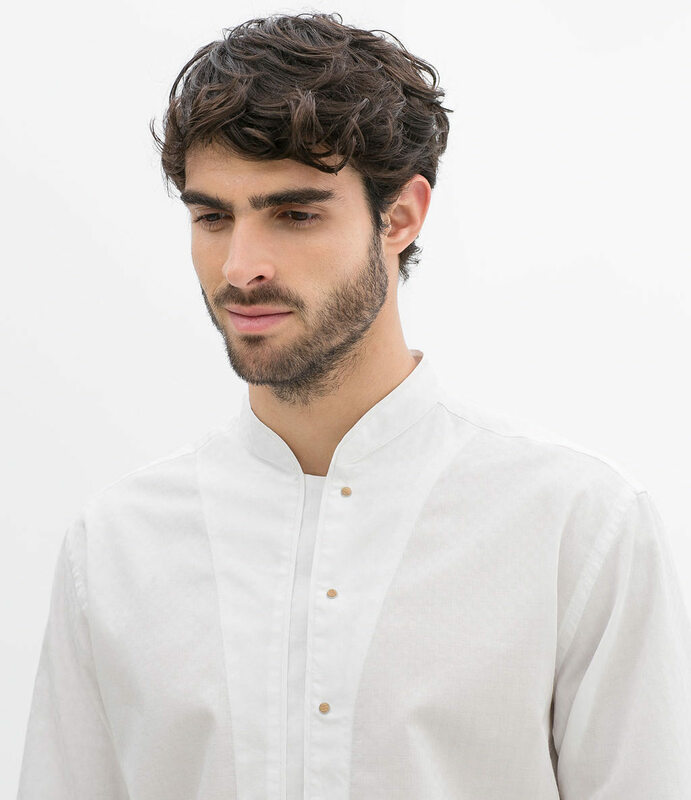 Which is why I particularly love the oriental collar trend, seen at Delhi Fashion Week and downplayed in the New Yorks and LAs as a granddad collar. 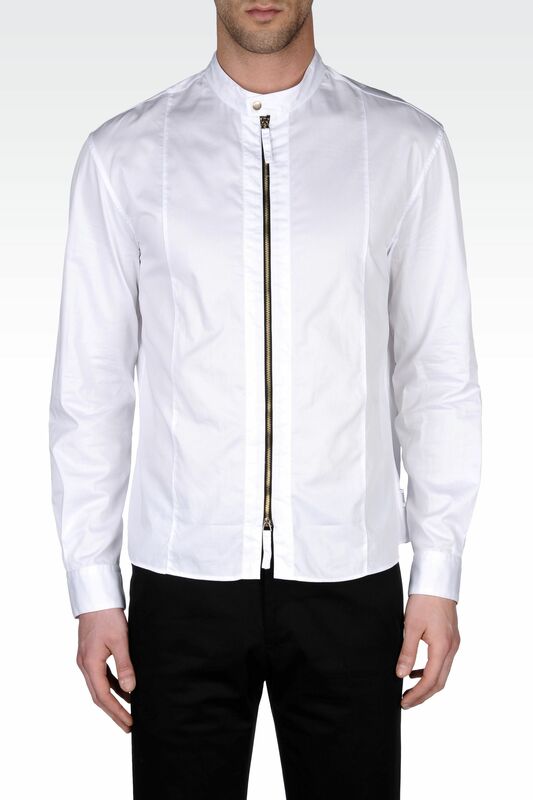 It is understated, can be dressed up or down, and with no place for an archaic tie or a hipster bowtie. 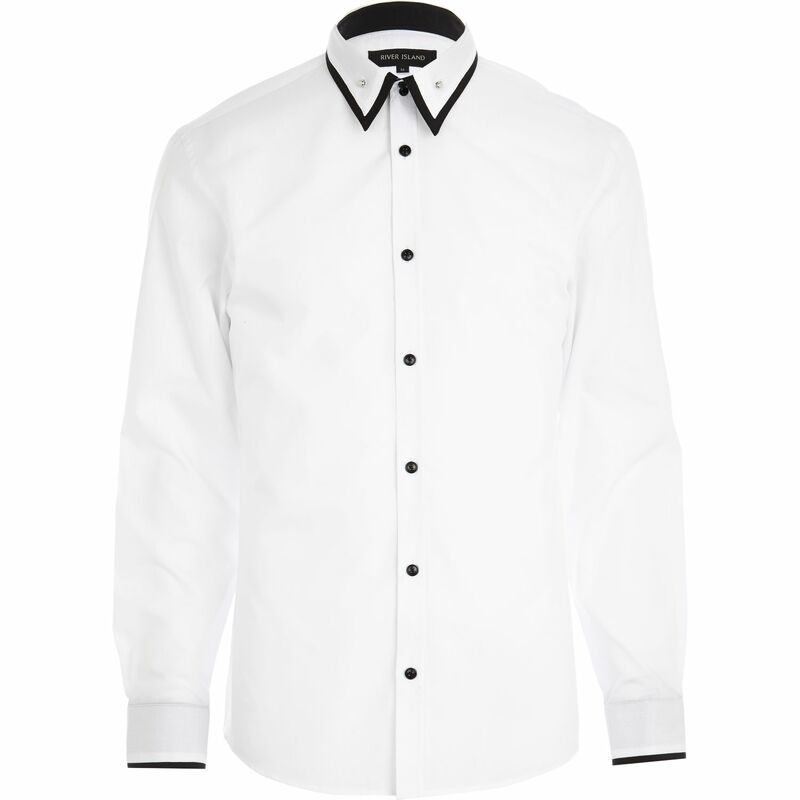 Some favorites include black detailing by River Island (now also available in the US! 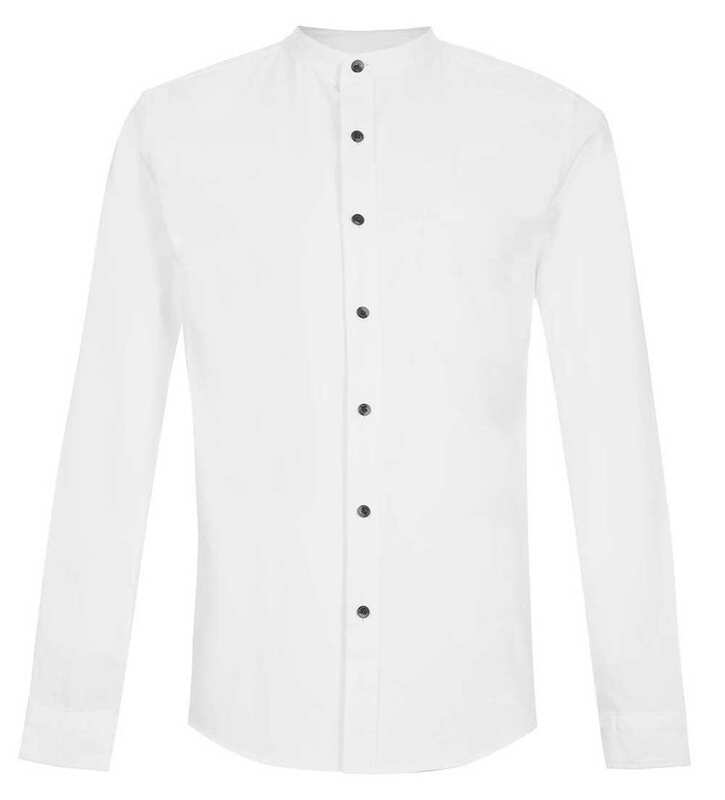 ), a stand collar Oxford by Topman, and Zara’s Mao collar with snap buttons. 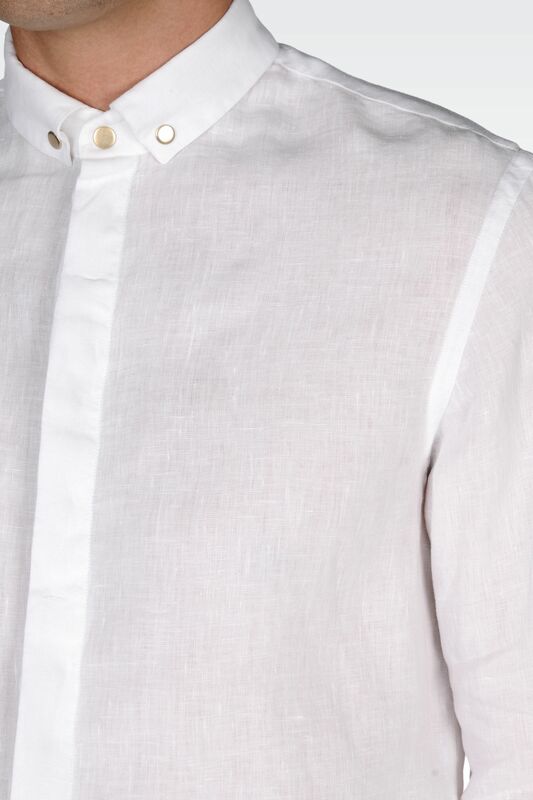 Piping is the understated art of looking dapper without much effort. 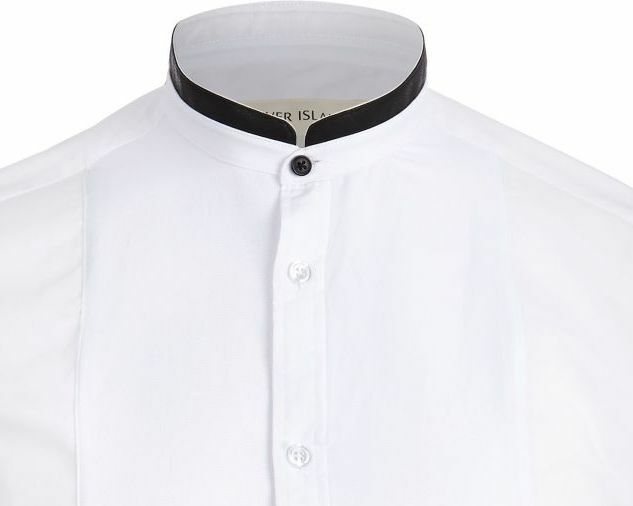 Piped collars for example, outline not just the shape but lend an elevation to your shoulders, making the neck seem more defined. 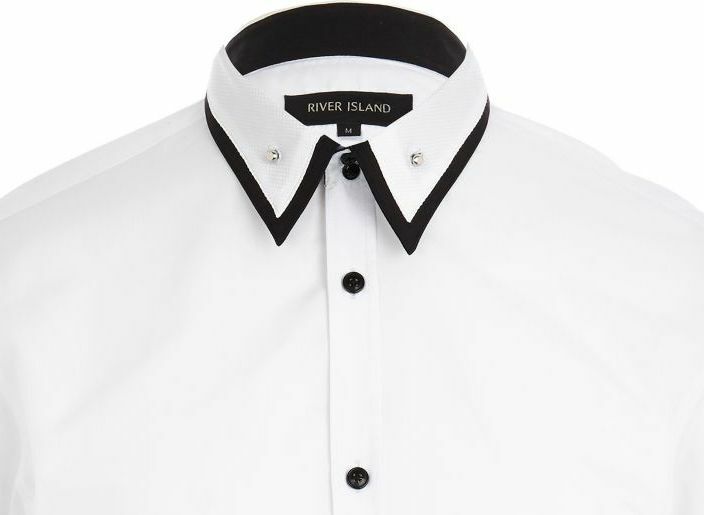 Piping comes in a plethora of varieties for crisp and crisper: River Island scores with piped collars with matching black buttons for a formal and luxe look, while CY Choi goes more mischievous with a thick collar and sleeve piping, and Zara keeps it plainer and somber for a simpler look. 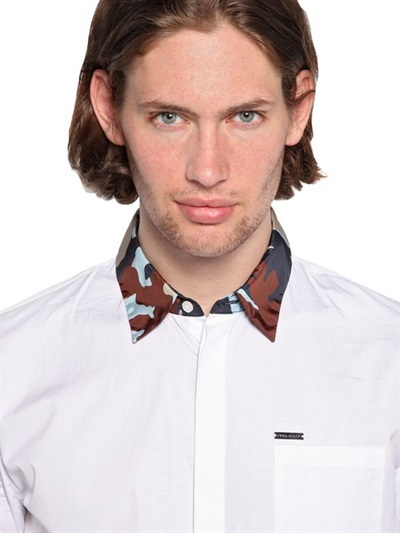 Let’s face it, you want to show an edge but don’t want to opt for a Looney Toons tie or are worried nobody will notice your polka dotted socks, but don’t want to wear a ghastly printed shirt under a suit too. 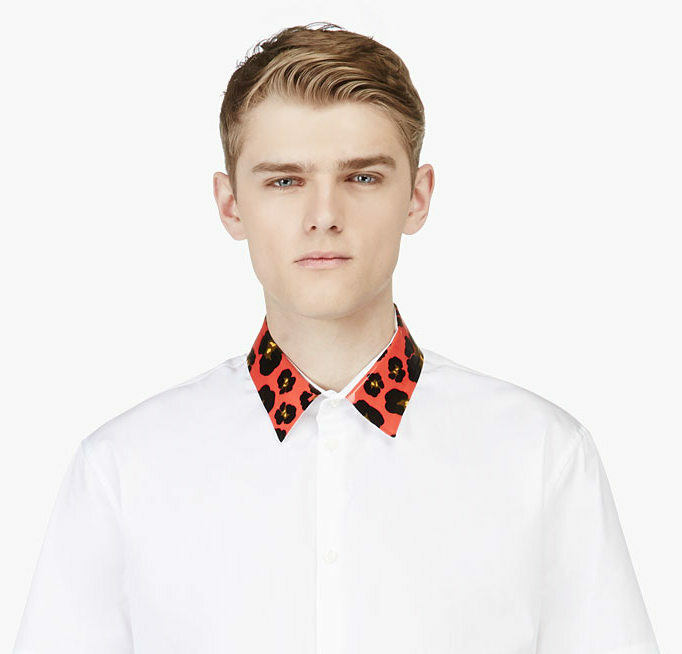 The solution is to simply have a playful print on the collar alone. 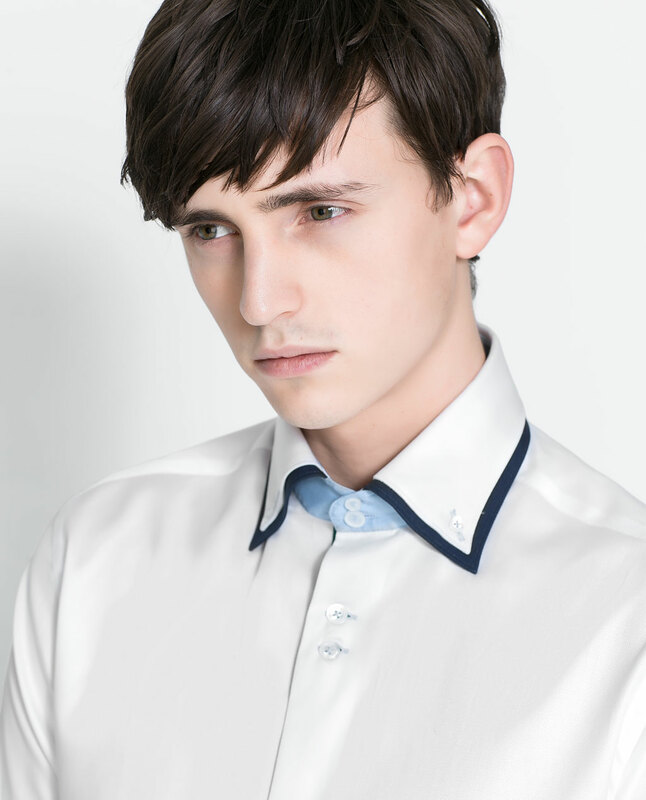 Adorned by me on non-whites often, with an argyle, contrast or polka dotted collar, the trend seems to be foraying into formals too. 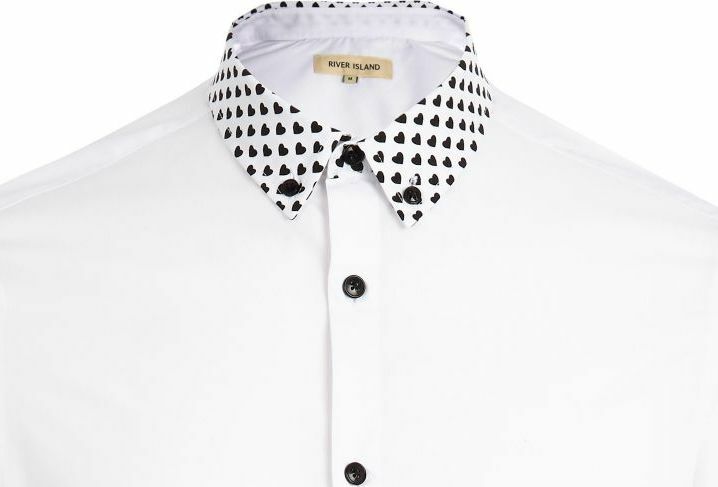 Take River Island’s heart infused collar, perfect for a cheeky corporate or a playful date night without going over-the-top. 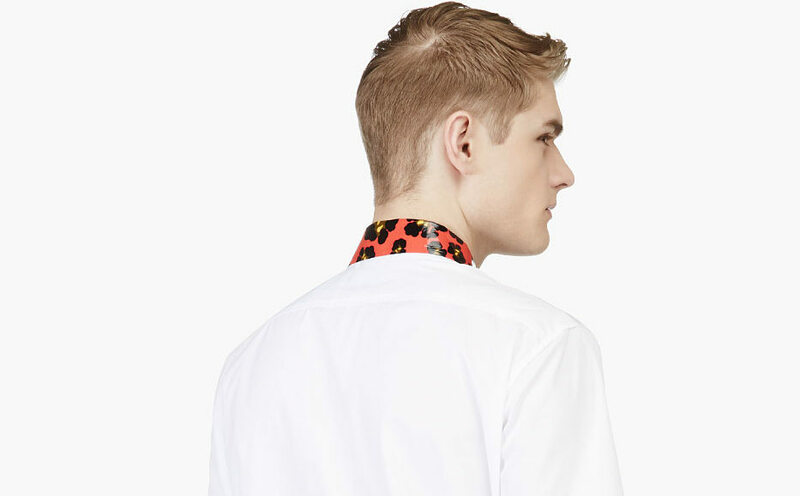 DSquared2 infuses animal print and camo equally well. 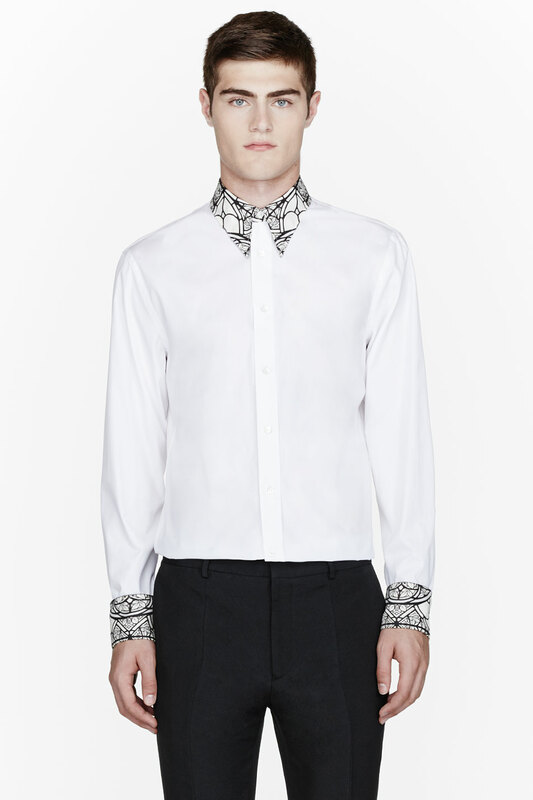 And Alexander McQueen’s theatrical stained glass effect keeps it for after hours. In case we didn’t pick up on the collarifying trend, its here to stay. 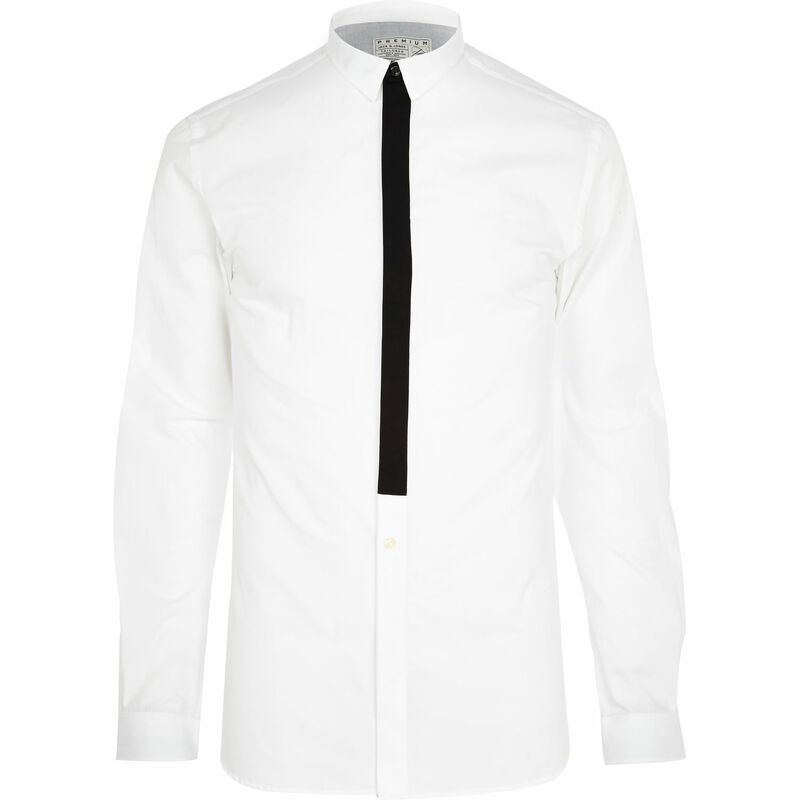 For a sharp collar forces one to sit and stand with poise, improving structure and drawing the right attention. 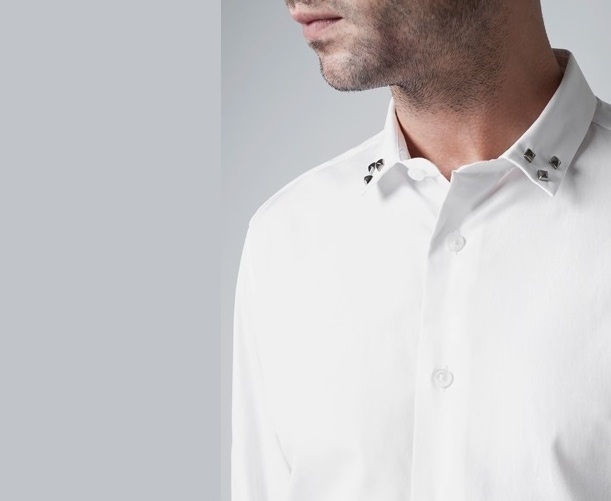 Collar accessories help in drawing attention to the neck area, like collar pins to loop them together, or collar studs to add starchy definition. 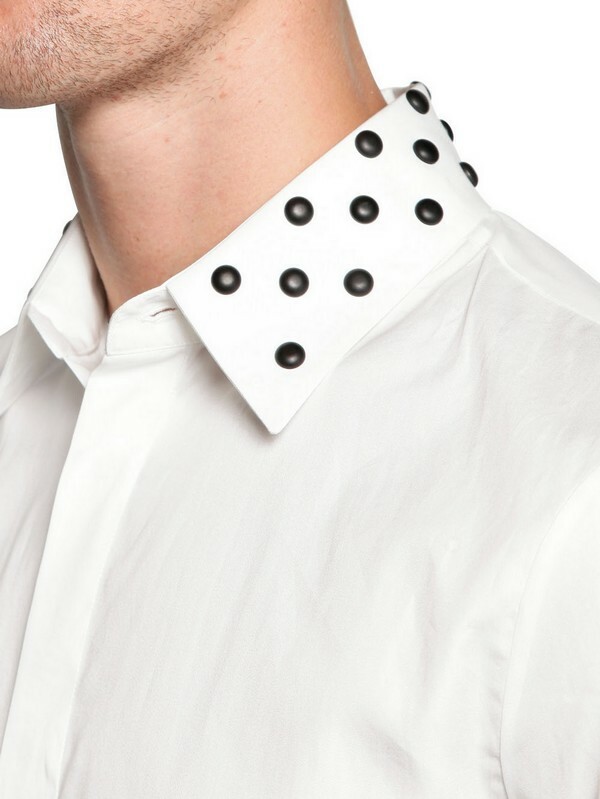 Thank you Zara and DSquared2 for placing studs on your collars, marrying the metal with another trendA, while Armani Collezioni goes refined with metallic grommet-like collar closures. 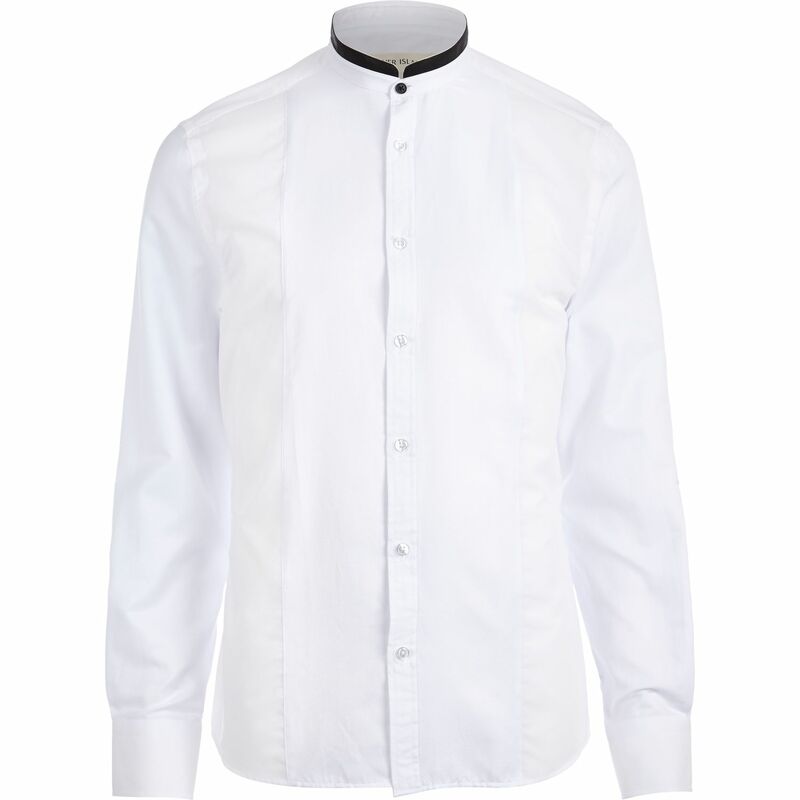 And thanks to River Island and Topman for providing studs and collar pins with sparkling white shirts for a dash of poise. There’s something rather heroic, charismatic almost, about a vertical strip down from your Adam’s apple to pelvic center, perhaps the sheer drop in eyeball that goes from the face down the abdomen to the areas of interest. As many of my Instagram followers will know, I prefer open neck clothing to allow for breathability and to draw attention to the muscle that holds up your face. 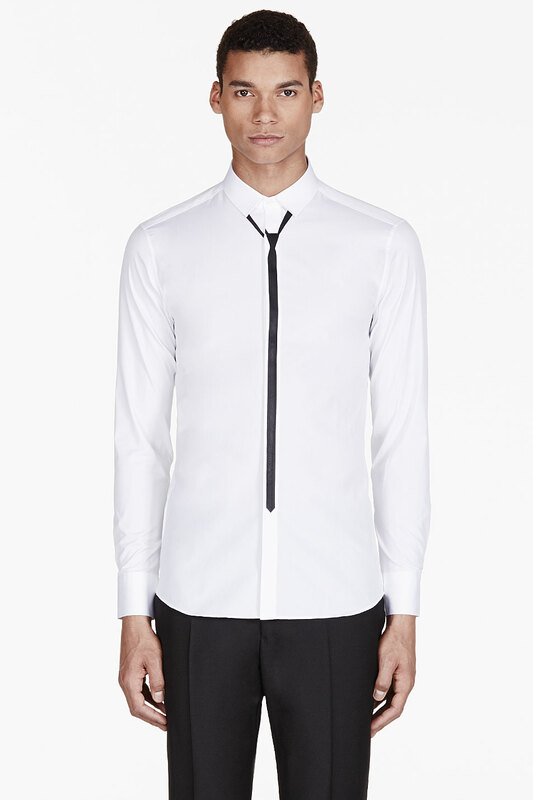 Which is why faux ties work so well; not ones that are a literal replacement, but a solid vertical line against the chest. 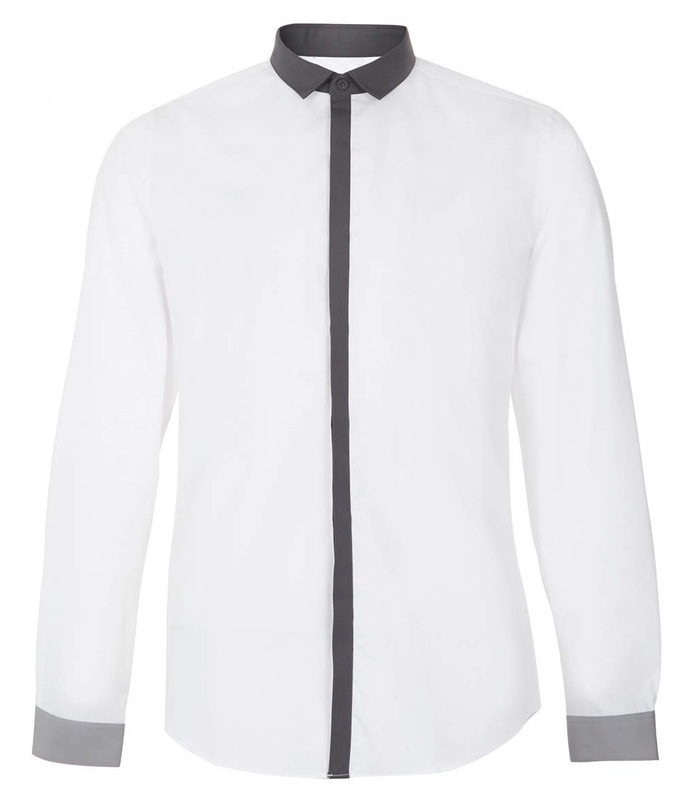 River Island’s is the slickest take on this with an apt width and blunt end tie placket, contrary to Neil Barnett’s whimsical print skinny. 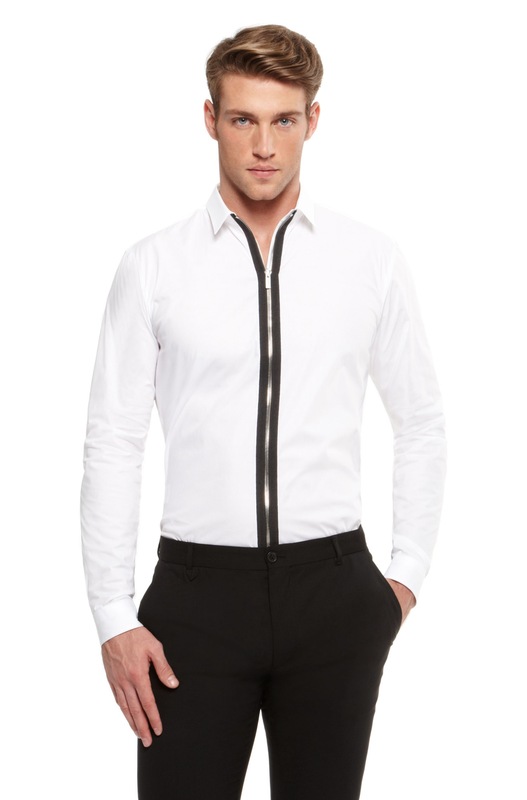 While DSquared2 goes cheeky by hiding a hint of color behind a placket, the fad of zippers is catching on too, with the likes of Armani Collezioni and Hugo Boss including metallic or black zippers for the urgent drive that sunset brings to our lives. 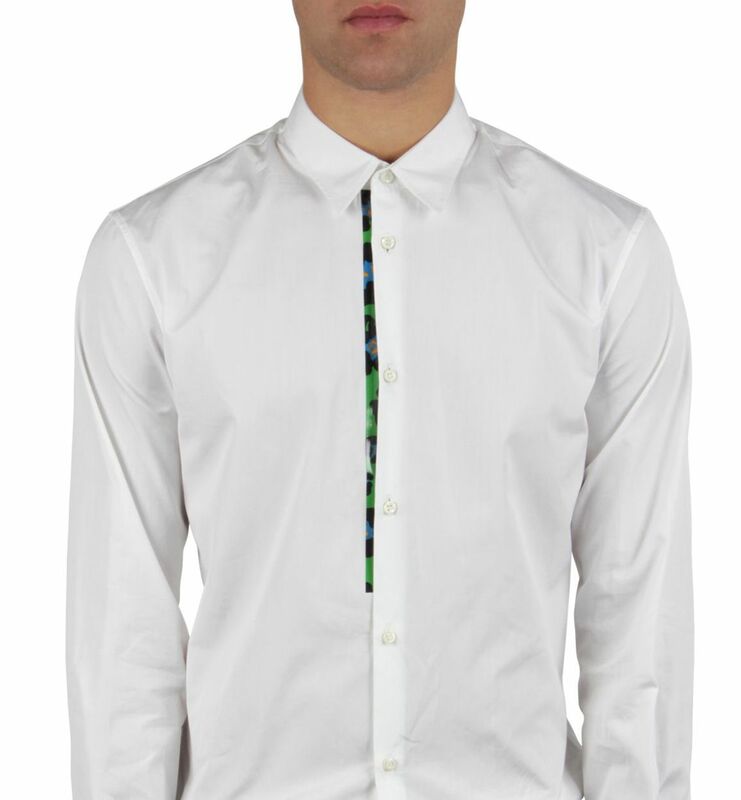 Guys, we now have no excuse for not looking dapper.